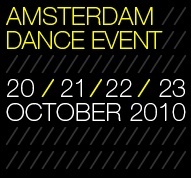 The Amsterdam Dance Event (ADE) is the leading electronic music conference and the biggest club festival for electronic music. Founded fourteen years ago, ADE first came to light in 1996 as a small conference with a few hundred music professionals and a festival program in 3 clubs with 30 DJs. Now in 2010, ADE has grown to become the ultimate platform to meet international business partners, introduce businesses to a worldwide audience and get in touch with new people, new music and new trends.